Soybeans are a healthy source of high-quality protein and healthful, low saturated fat cooking oil that is high in Vitamin E. Soybeans contain no cholesterol, little or no saturated fat, and plenty of protein and dietary fiber. Soy foods can be an important part of a healthy diet as proscribed by the USDA. The more researchers take a look at the soybean, the more they like what they see. Increasingly, scientific studies, many of which America’s soybean farmers support with their checkoff, point to the soybean as a vital part of a healthy diet. In these days when demand is greater than ever for foods that taste good and are good for you, the soybean can do it all. These large soybeans are harvested when the beans are still green and sweet tasting and can be served as a snack or a main vegetable dish after boiling in slightly salted water for 15–20 minutes. They are high in protein and fiber and contain no cholesterol. 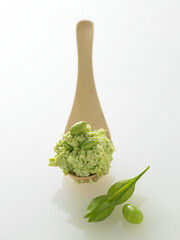 Green soybeans are sold frozen in the pod and shelled. Natto is made of fermented, cooked whole soybeans. The fermentation process breaks down the beans’ complex proteins so natto is more easily digested than whole soybeans. In Asian countries natto traditionally is served as a topping for rice, in miso soups, and is used with vegetables. Natto can be found in Asian and natural food stores. Miso is a rich, salty condiment that characterizes the essence of Japanese cooking. The Japanese make miso soup and use it to flavor a variety of foods. A smooth paste, miso is made from soybeans and a grain such as rice, plus salt and a mold culture, and then aged in cedar vats for one to three years. Soybeans soaked, ground fine and strained produce a fluid called soybean milk. Plain, unfortified soymilk is an excellent source of high-quality protein and B vitamins. Soymilk is most commonly found in aseptic containers (nonrefrigerated, shelf stable), but also can be found in quart and half-gallon containers in the dairy case at the supermarket. Soymilk is also sold as a powder that must be mixed with water. Soy sauce is a dark-brown liquid made from soybeans that has undergone a fermenting process. Soy sauces have a salty taste, but are lower in sodium than traditional table salt. Tofu, also known as soybean curd, is a soft, cheese-like food that easily absorbs the flavors of other ingredients with which it is cooked. Tofu is rich in both high-quality protein and B vitamins and is low in sodium. Firm tofu is dense and solid and can be cubed and served in soups, stir fried or grilled. 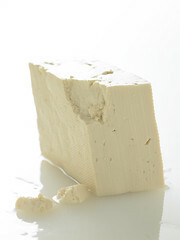 Firm tofu is higher in protein, fat and calcium than other forms of tofu. Soft tofu is good for recipes that call for blended tofu. Tempeh, a traditional Indonesian food, is a chunky, tender soybean cake. Whole soybeans, sometimes mixed with another grain such as rice or millet, are fermented into a rich cake of soybeans with a smoky or nutty flavor. Tempeh can be marinated and grilled and added to soups, casseroles or chili. Made from roasted, whole soynuts, which are then crushed and blended with soybean oil and other ingredients, soynut butter has a slightly nutty taste, significantly less fat than peanut butter and provides many other nutritional benefits as well. Soy-based infant formulas are similar to other infant formulas except that a soy protein isolate powder is used as a base. Carbohydrates and fats are added to achieve a fluid similar to breast milk. The American Academy of Pediatrics says that for term infants whose nutritional needs are not being met from maternal breast milk or cow milk-based formulas, isolated soy protein based formulas are safe and effective alternatives to provide appropriate nutrition for normal growth and development. Soy flour is made from roasted soybeans ground into a fine powder. Soy flour is 50% protein, so it boosts the protein in recipes. Soy flour is gluten-free and three kinds are available: Natural or full-fat, which contains the natural oils found in the soybean; defatted, which has the oils removed while processing; and lecithinated, which has lecithin added to it. Extracted from soybean oil, lecithin is used in food manufacturing as an emulsifier in products high in fats and oils. When protein is removed from defatted flakes, the result is soy protein isolate, the most highly refined soy protein. Containing 90% protein, soy protein isolates possess the greatest amount of protein of all soy products. They are a highly digestible source of amino acids. Soybean oil is the natural oil extracted from whole soybeans. 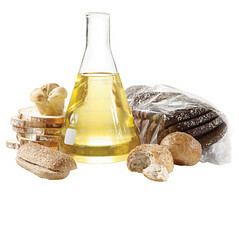 It is the most widely used oil in the U.S., accounting for more than 65% of our total vegetable fats and oils intake. Oil sold in the grocery store under the generic name “vegetable oil” is usually 100% soybean oil or a blend of soybean oil and other oils. Soybean oil is cholesterol free and high in polyunsaturated fat. New oils are also being produced from high oleic soybean varieties that contain no trans fats and less saturated fat. To learn more about soy nutrition and healthy soy foods, get nutritious soybean recipes, order or download the Soyfoods Guide from the United Soybean Board and the soybean farmers’ checkoff, or visit thesoyfoodscouncil.com. If you want to learn more about the positive impact soy can have on your health, visit soyconnection.com and click on the Soy & Health Fact Sheets.